When you use merge tags to personalize your campaign, it's a good idea to set default values to display for recipients who don't have any data for that field. For example, you could set the default value for your first name tag to "Friend." When you use "Hello *|FNAME|*," in a campaign, subscribers whose first names are not in the system will see "Hello Friend." In this article, you'll learn two ways to set default values for your audience fields. To set the default merge tag values from the your audience settings, follow these steps. In the fields in the Default value column, type the default values for your merge tags. Default merge tag values are available for all fields except the required Email Address field. From this page, you can also add new audience fields, edit field labels and tag names, set required fields, and choose whether to hide or display the field in your signup forms. To delete a field, click the trashcan icon to the right of the Default value field. 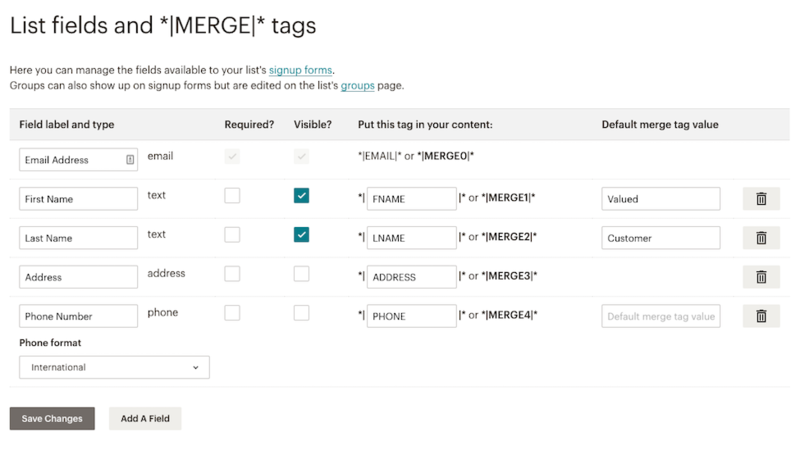 To set the default merge tag values from inside the Form Builder, follow these steps. On the Build it tab, either create a new field or click on an existing field to edit. On the field settings tab, type in the default merge tag value field the text you want to appear when a subscriber's data is not available, and then click Save Field. From the Form Builder, you can also add new fields, edit field labels, tag names, set required fields, and choose whether to hide or display the field in your signup forms. Default merge tag values are available for all fields except the required Email Address field. Also, default merge tag values for image fields will only display text. Default merge tag values will only display in campaigns, and not in your audience fields.